In order to unlock the fourth map in Battlefield 1943, players will have to rack up 43 million kills over Xbox Live and PlayStation Network. So you say you want your fourth map in Battlefield 1943? Well, maps don't come easy in this world - you need to earn them, with the blood, sweat and tears of your opponents. Only after 43 million kills have been achieved on Xbox Live and PlayStation Network will the "Coral Sea" map be unlocked. Coral Sea features an "all-new Air superiority game mode" that will have players competing for airborne supremacy in intense dogfights. 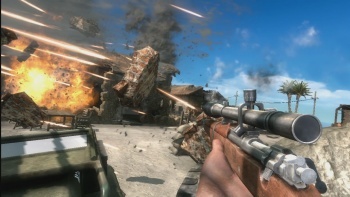 The other three maps, Iwo Jima, Gaudalcanal and Wake Island, come as part of the default Battlefield 1943 package, while Coral Sea is dubbed a "fourth bonus map." This is what EA and DICE are calling a "community challenge," but I'd call it a "entice people to keep playing your game before they can get their money's worth" challenge. I suppose it's no different in principle from Noby Noby Boy's forcing people to play to unlock new planets, but there's a difference between a game where you stretch a snake-boy-thing and poop and Battlefield. So, only three maps and one that's going to take at least some time to unlock. Seems like a rip off? Well, it's only $15, so decide for yourself when it comes out this June on 360/PS3 and in September on PC. looking at it, for $15 thats quite a decent lil package. Assuming the maps are varied enough I think the unlockable 4th map is a kewl idea to keep ppl playing the game. Why must they give us PC gamers such a painful wait? And, as WoW proved with Ahn'Qiraj, that map will be unlocked preeetty quickly. I think they're all remakes of old Battlefield 1942 maps, and if they really are, these are the best ones from that game. First thought: Why do they have to do that? Is it because the map isn't finished, and they just need more time? Second thought: Wait a sec... C-c-c-c-Coral Sea?! HELL YES That was my all-time favorite 1942 map. My desire for this game just went up. Still not a confirmed buy unless they up the max player count though. I would probably be interested in the game had they not reduced the player classes from 5 too 3 and given you unlimited ammo and regenerating health thus destroying much if not most of the tactics needed to stay alive. I can do it. Single-handedly. We will have that map by...2085. Lol, according to "top scientists", we'll have drowned long before that. Seriously, while I was reading an article on global warming for a living environment class, one prediction said that sea levels would rise about 80 feet in a little over 30 years. When it was first announced, I was so happy... But now this game is beginning to embody all that is wrong in video games today. No thank you EA, I'll stick with 1942. It ain't as pretty or realistic, but with the Battlegroup42 mod, I have almost fifty extra maps compared to 3. Well, 4, according to Keane, but I'll be three days dead and skull-fucked before I ever dedicate that much time to a video game. if thats true, it would be like having to kill every person that has ever played World of Warcraft about 3 time in order to ever play that map. thinks about the first person to do it, they would just have to wait until some other guy to kill 43 million in order to have a game. Four maps. Four. Please tell me there are more, and please, please, please tell me you aren't going to charge for them. Yeah especially looking the graphics it seems like a good deal. I just hope that they do add more maps in the immediate future in (hopefully free) dlc. 43 million between EVERYONE. Like 1million players kill 48 people each that sorta thing, gedit? Rather than let PC gamers create hundreds of custom maps and kill the market for ridiculously overpriced downloadable maps, they milk the community-map/mod-starved console gaming masses for a few months. Well, DICE did say that the PC one needed more time, mainly because of some extra features their putting into it, which one of those is larger player counts than on the PS3/360. I'm definitely going to be part of that push. I really didn't need an extra map as incentive, though. I recently lost my copy of Battlefield 1942, and I miss Wake Island. This is going to be fun. What about the PC? Is the new map going to be console exclusive? If yes, F U EA. The only way they could screw this up, by releasing the map for nothing on PC. If Halo and CoD are anything to go by that'll happen in about a week. Actually scratch that, two days. Four maps? So that game's going to be DLC central. Lol, when I first saw it I was thinking it would be impossible to unlock as well. If they're only making four maps (designed for 24 players), then the game had better be moddable like you wouldn't believe. Being a gamer, all be it only casual, I feel I can be as misanthropic as the next person but getting 43 million kills is just unreasonable. Especially as I'd have to wait an extra couple of months for it to come out on P.C. My best guess is that there was a little less than 43 million civilian casualties during WWII. Or the fact that it's called Battlefield 1943. Or both. A good system: Play the game, we'll unlock extra content for you! This should be the new system of giving out DLC: when people achieve a target number, give them new content to keep them playing. Sounds smart to me! I can't wait to try this game out. I think this is a cool way to keep people playing, which is actually I'd argue good for the consumer too, because as long as there are people interested in playing it, there will be less times waiting in lobbies for games to fill up. I hate how in old Xbox games it takes forever to find people to play with. If it doesn't have Call of Duty or Halo attached to it, you can wait like 5 minutes just to start a game that will last 2 minutes. I wonder if it has to be 43 million kills on each network (i.e. 43 million on PSN, 43 million on XBL). If it's counting kills for both, it shouldn't take that long to unlock that fourth map. It's 43 on XBL, 43 on PSN which is kinda interesting.